Quad Close Trap Seal (Stink Stopper), 2015 IAPMO/UPC and ICC/IPC Plumbing Codes - Jay R. Smith MFG Co. 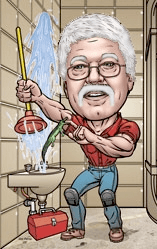 The 2015 editions of the IAPMO/UPC AND ICC/IPC plumbing codes have been released. International Plumbing Code/International Code Council (IPC): The IPC has included reference to the ASSE Standard #1072, Barrier Type Floor Drain Trap Seal Protection Devices. SECTION 1002 PARAGRAPH 1002.4.1.4 Barrier-Type Trap Seal Protection Device. A barrier-type trap seal protection device shall protect the floor drain trap seal from evaporation. Barrier-type floor drain trap seal protection devices shall conform to ASSE 1072. The devices shall be installed in accordance with the manufacturer’s instructions. What does this mean? Some municipalities and/or inspectors would not previously allow installation since the 2012 code edition did not contain a written description of the product and no reference to the ASSE 1072 standard. Now, both of these are in the 2015 edition. You still may encounter some inspectors who may not allow it by exercising their administrative authority. This is typical for new products. We still recommend it’s usage in conjunction with a trap primer valve. It provides double protection when both are used. Some inspectors may allow it to be installed without the trap primer valve but it is your responsibility to check with your local inspector. The code does not specifically identify how it is to be installed. Two of the competitors obtained an ICC-ES PMG Listing (ES – Evaluation Service) report many years ago for their trap seal device. The primary reason to obtain this type of report is when there is no language describing the product in the code text and there is no reference to a national standard. Technically, these are no longer required since the code now recognizes this type of device. These particular ES reports for the trap seal were technically not valid because they contained incorrect information. When these two reports were obtained, there was not an ASSE National Standard in existence. IAPMO/UPC did not include the language or standard reference. In fact, nothing was included as this section remained the same. This was very surprising! However, since the Quad Seal is listed with IAPMO, this should not be a major issue and business as usual. We will continue to renew our IAPMO/UPC and ASSE listings annually. If updated listing certificates are needed, please contact Sales Engineering. Rectorseal (Sure seal) continues to advertise their product can be installed without a trap primer valve. Remember, the local inspector must allow such before you can arbitrarily eliminate the trap primer valve. IAPMO has stated to us they will not allow the elimination of the trap primer valve.